Staffing requirements can now be defined for each day, using Daily Staffing Requirements. 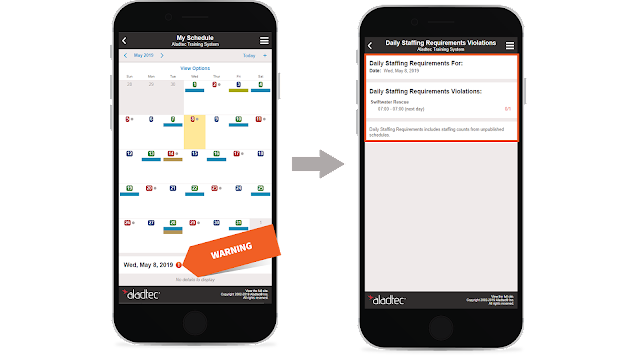 Similar to staffing requirements defined for a schedule, a warning will be displayed when the Daily Staffing Requirements are in violation. 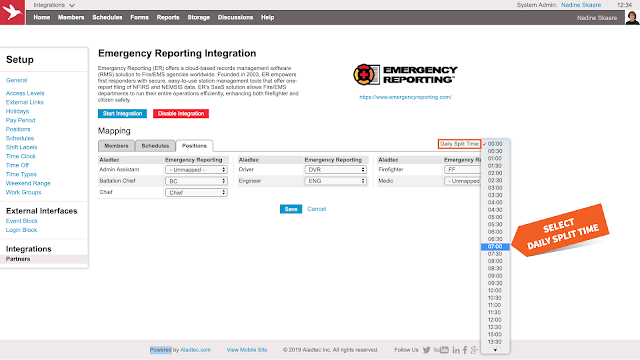 For example, Daily Staffing Requirements can be used to display a warning when the required number of full-time members is not met or when no members are scheduled with a required qualification, such as Swiftwater Rescue or HazMat. down to the hours within each day of the week. for the minimum number of members. 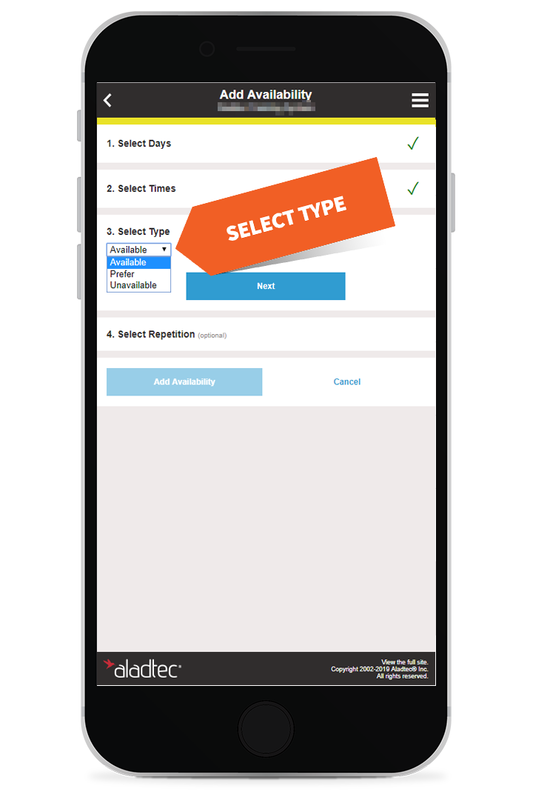 for multiple qualifications using member database fields, including any combination of select lists, multi-options, and expiration dates. In the following example, Daily Staffing Requirements are set up to require at least one member with a non-expired certification for Swiftwater Rescue per day. 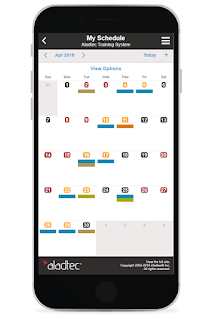 When the Daily Staffing Requirement for Swiftwater Rescue is violated, a warning and the details of the violation are available in the Work Schedule views, shown in the Monthly Calendar view below. 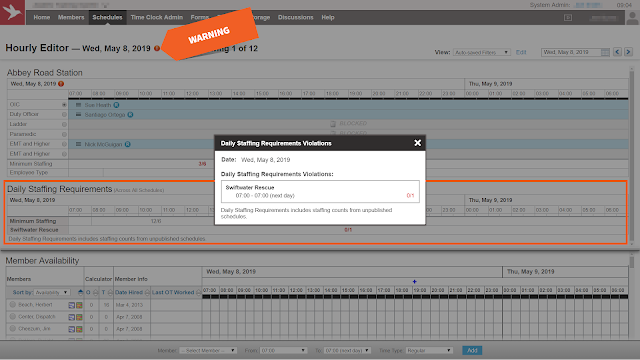 The Hourly Editor also includes a warning for the Daily Staffing Requirements violation. 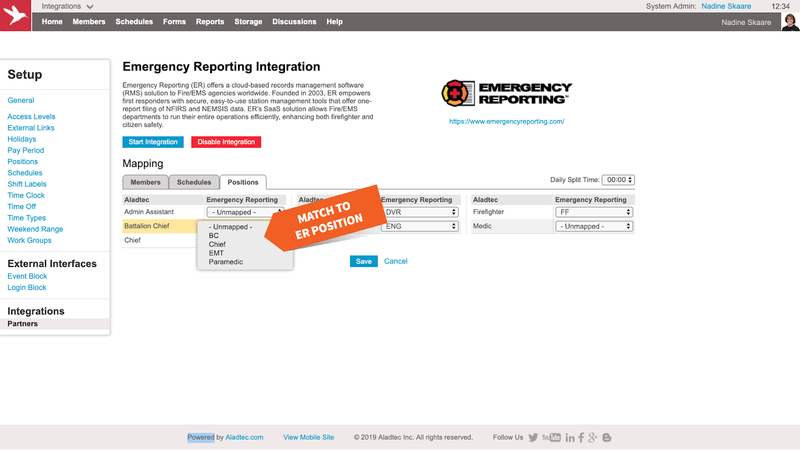 In this example, the violation details indicate one member is needed to fulfill the Daily Staffing Requirement for Swiftwater Rescue. 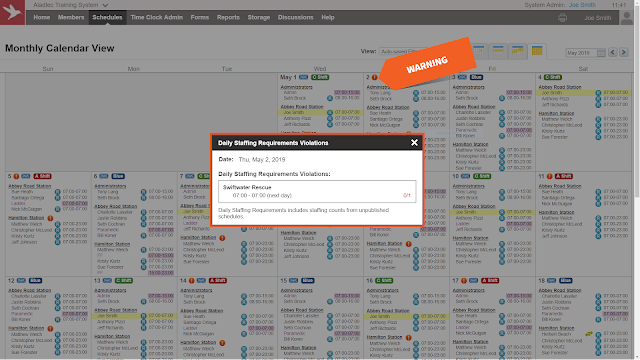 The Daily Staffing Requirement warning is visible to all members on My Schedule. 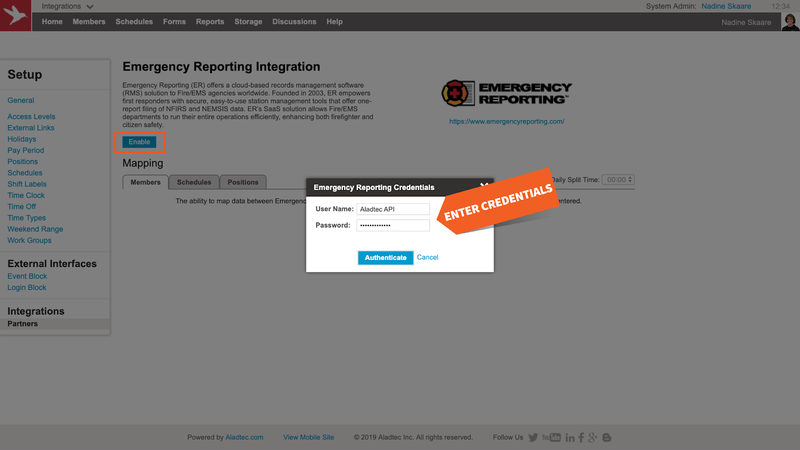 Members can also view the violation details for consideration when signing up for shifts. To learn more on using Daily Staffing Requirements, click on the video below. at support@aladtec.com or 888.749.5550. As always, thank you for using Aladtec! 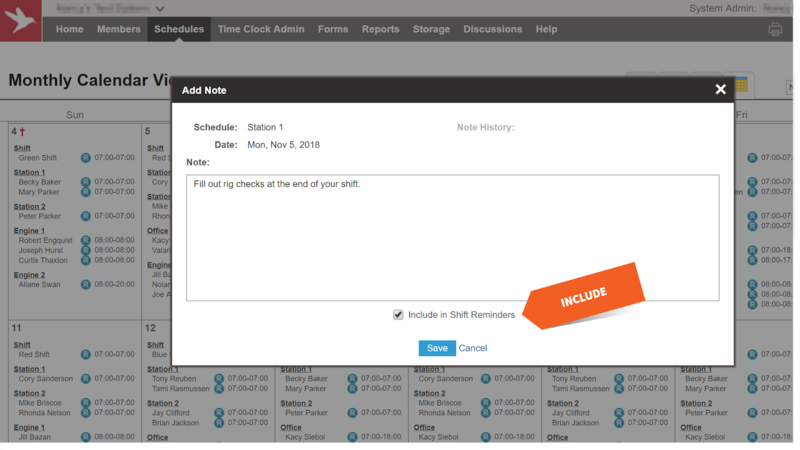 Shift Labels can be used to add a label and color to each schedule day in Aladtec. The labels and colors can be customized to provide a sense of familiarity for members, e.g. Red/Gold/Black shifts, A/B/C shifts. 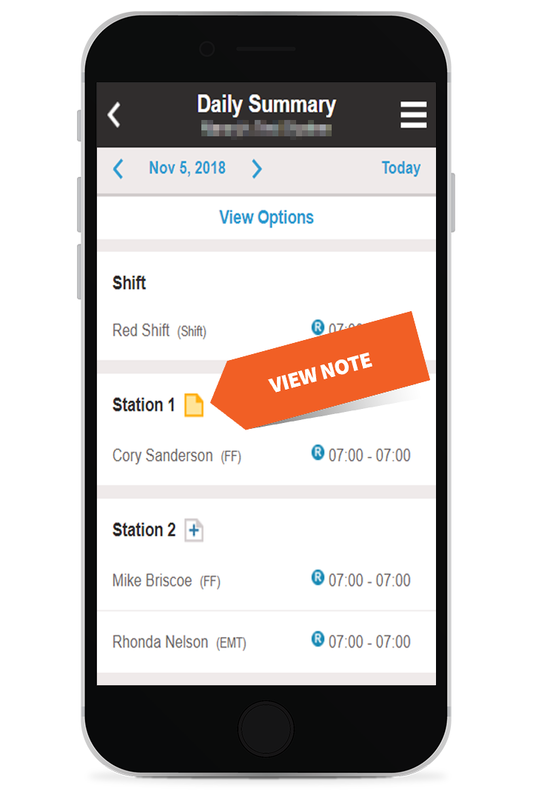 With Shift Labels, whether on mobile or desktop, it’s easy to quickly glance at any of the schedule views to see which shift is working and identify upcoming shifts. 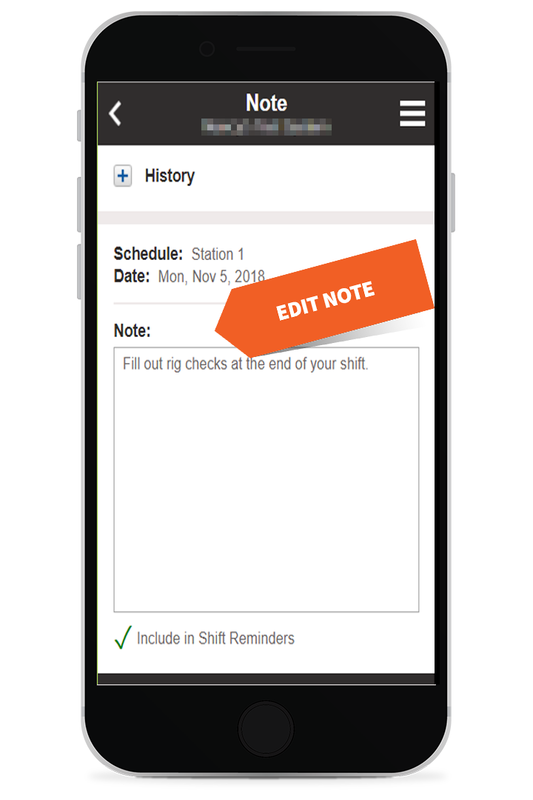 In Setup, multiple Shift Labels can be added, each with a short text label and color. Every Shift Label represents 24 hours and Shift Labels can be repeated to create a rotation. In the example below, Shift Labels are repeated to create a 48/96 rotation. Once the labels and colors are added in Setup, Shift Labels are displayed in all desktop and mobile schedule views. Shift Labels make it easy to quickly see specific shift days, such as all the Gold shift days in the Monthly Calendar below. 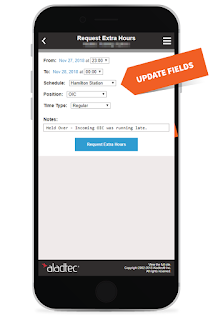 On mobile, while Shift Labels are automatically displayed on the Daily Summary, it is optional to include Shift Labels on My Schedule. 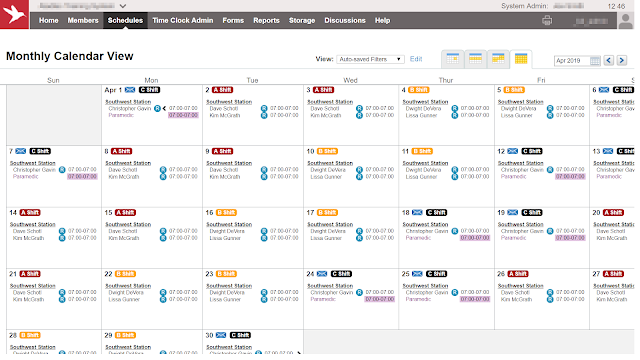 To include Shift Labels on My Schedule, simply modify the View Options, as shown below. For questions or additional help with Shift Labels, please contact the Support Team at support@aladtec.com or 888.749.5550. As always, thank you for using Aladtec! 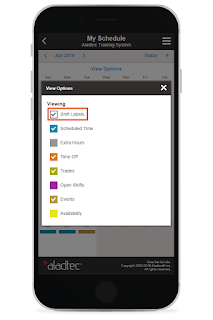 Aladtec released a powerful new interface to quickly add Availability for multiple dates. 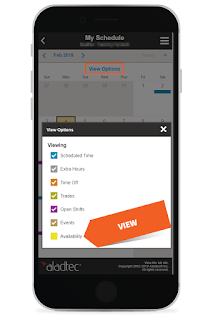 The mobile experience has also been updated to allow viewing and editing availability. Members, such as part-timers and volunteers, can use Availability to communicate scheduling preferences. 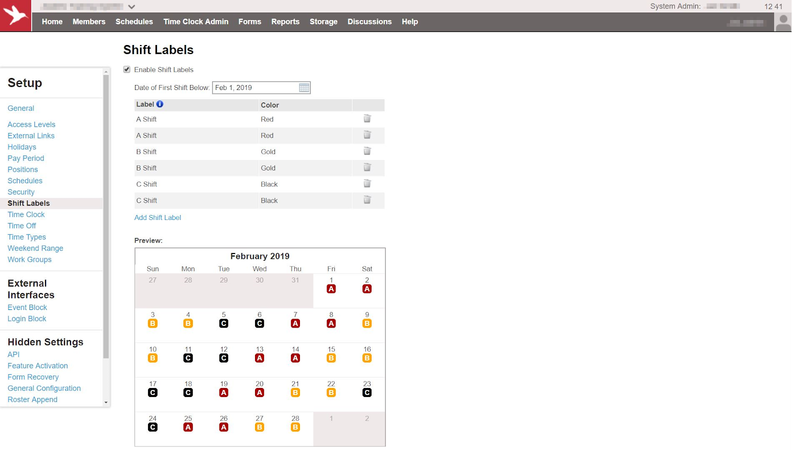 For instance, a part-timer may indicate which dates they are available to prevent overlaps with their personal schedule. Similar to desktop, on any mobile device, members can now go to the My Schedule page to view and add Availability, shown below. 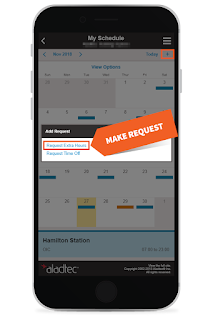 When adding Availability, multiple dates can be selected for a specific time range and type (available, unavailable, or prefer). 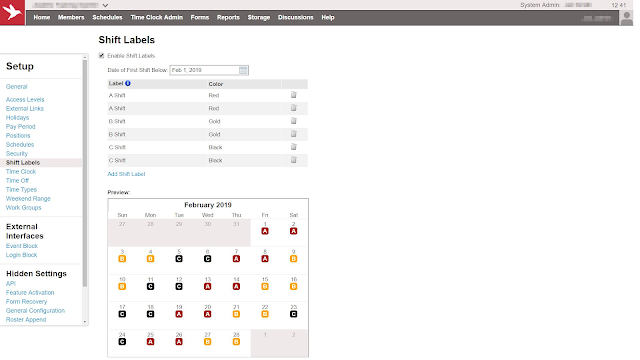 In the example below, multiple dates are selected to mark as Available. A repetition can be used when adding Availability. For example, a member may prefer to work every Monday (shown below). 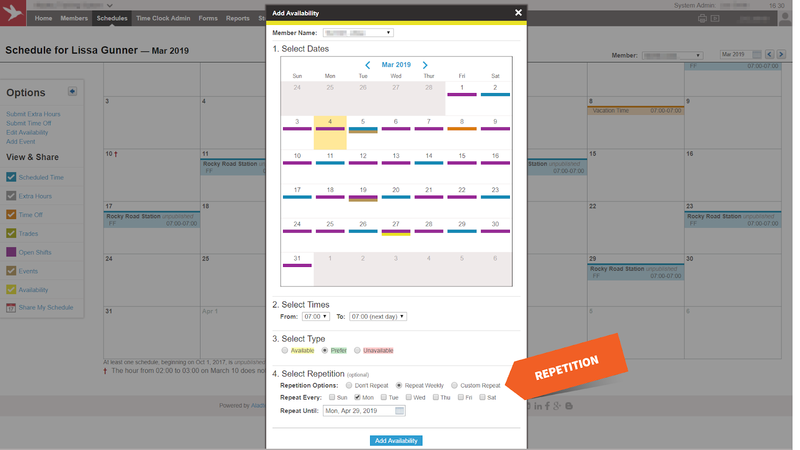 A repetition, custom or weekly, can be defined for a specific day, time range, and type of availability. For more detail on viewing and adding Availability, watch this video. 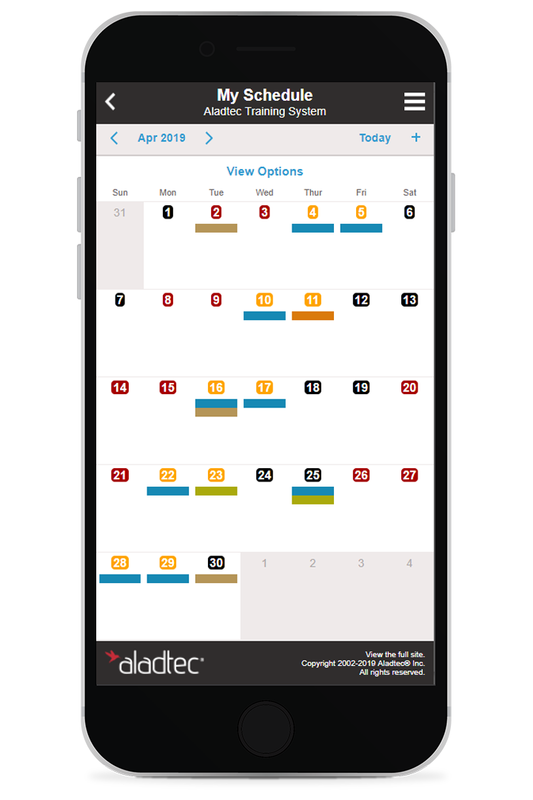 For questions or additional help with Availability, please contact the Support Team at support@aladtec.com or 888.749.5550. As always, thank you for using Aladtec! 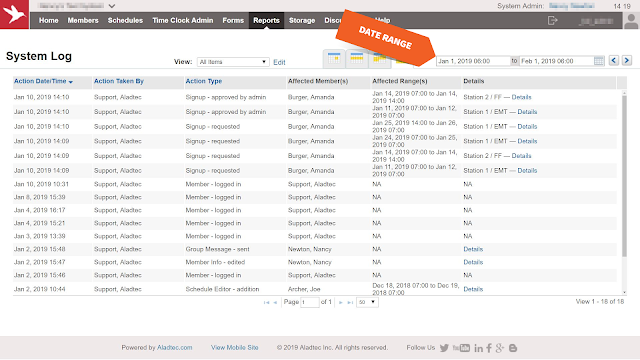 Information in the System Log can be narrowed down to focus on actions occurring within a specific date range, as shown in the example below. 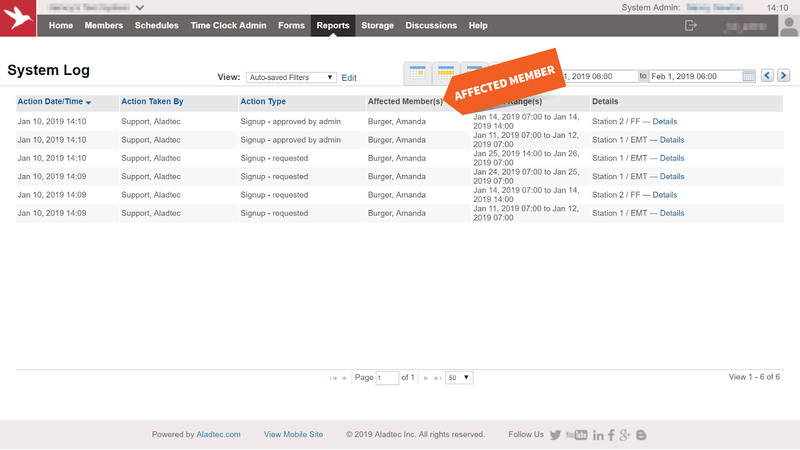 In addition, information in the System Log can be filtered based on actions taken by or affecting a specific member, as well as a specific time range. These filters are displayed when selecting Edit as shown below. 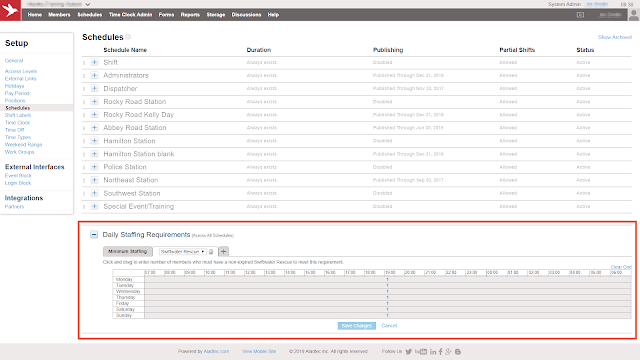 Applying these filters in the System Log will result in a more detailed output of information. 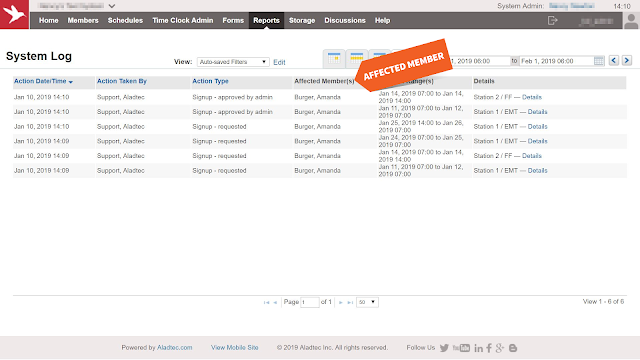 For example, the system log below shows all actions relating to Signups for one affected member within a month. 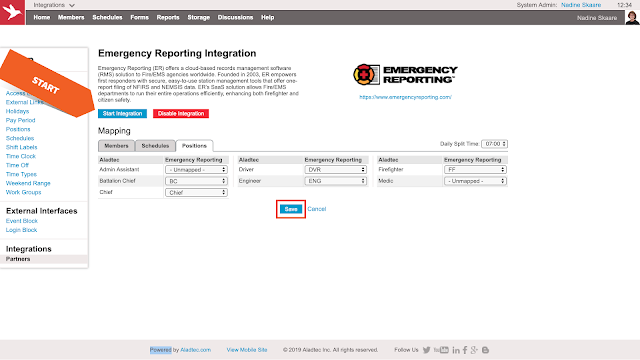 To learn more on using the System Log, click on the video below. 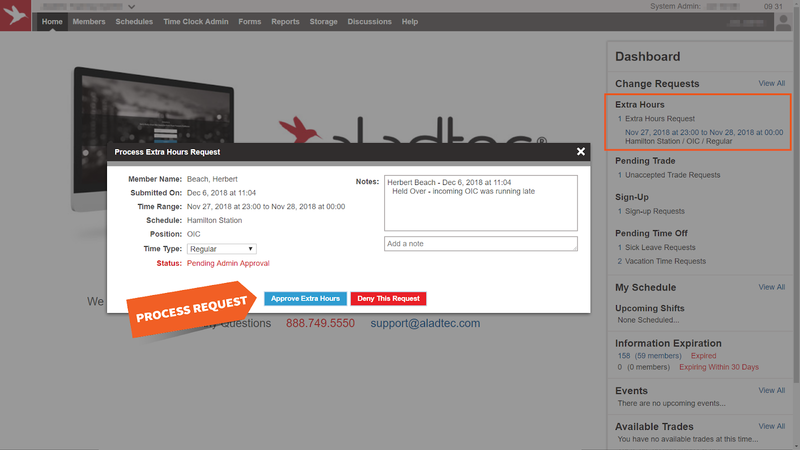 If you have any questions or would like additional help with the System Log report, please contact the Support Team at 888.749.5550 or support@aladtec.com. As always, thank you for using Aladtec! Schedule Notes can be added in the Hourly Editor or Schedule Views; Monthly Calendar View is shown below. 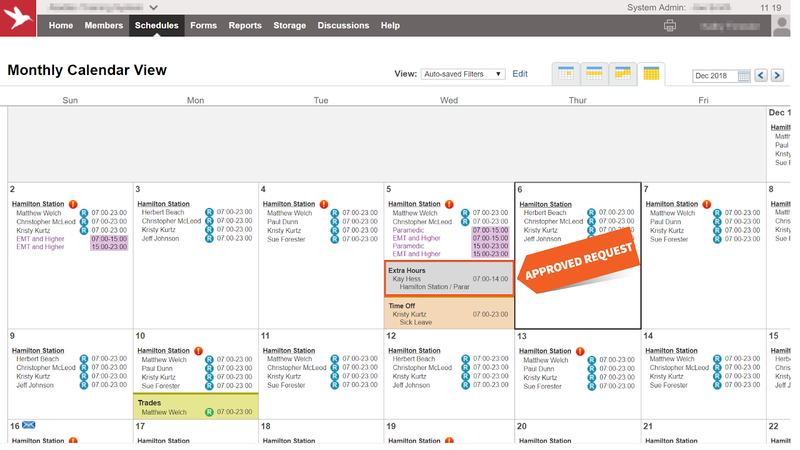 Schedule Authority is required to add or modify Schedule Notes. Schedule Notes can be included in Shift Reminders as well, see below. 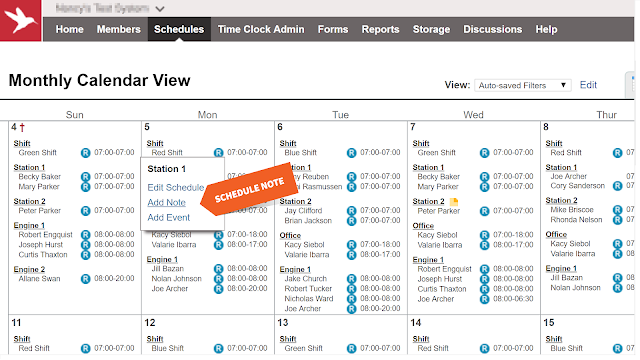 Schedule Notes are viewable by any member qualified to work on the schedule. For members with Schedule Authority, Schedule Notes can also be edited. An example of a Schedule Note in mobile is shown below. For more information on Schedule Notes, please contact the Support Team at 888.749.5550 or support@aladtec.com. As always, thank you for using Aladtec! 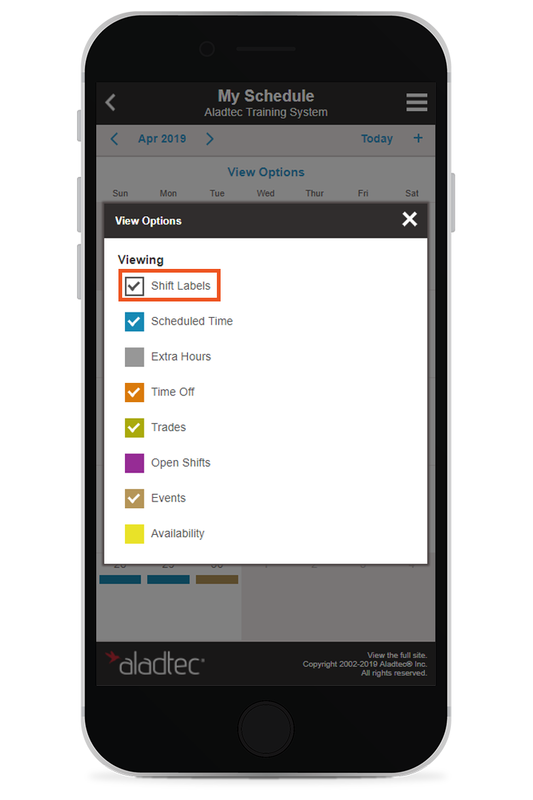 Aladtec has a new feature, Extra Hours, streamlining the workflow for tracking unplanned hours. Unplanned hours may happen in situations such as: holdovers, shift variances, shift adjustments, unscheduled overtime, and missed sign ups. Members request Extra Hours, which are approved by administrators, and viewed on schedule views and reports. To enable Extra Hours, in Setup, modify Access Levels and Work Groups. Access Levels control who is allowed to view Extra Hours in Schedule Views. Work Groups control who is allowed to submit Extra Hours requests. In Work Groups, shown below, administrative approval of Extra Hours requests is optional and Extra Hours are automatically included in Work Limits. Members can submit Extra Hours requests from My Schedule. 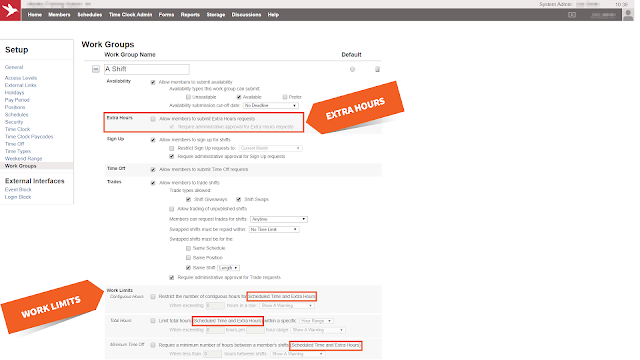 Extra Hours can only be submitted for time in the past which is within the system’s Historical Edit Limits (adjustable in Setup - General). A member cannot request Extra Hours overlapping their Scheduled Time or Time Off. Below is an example of an Extra Hours request submitted via mobile. 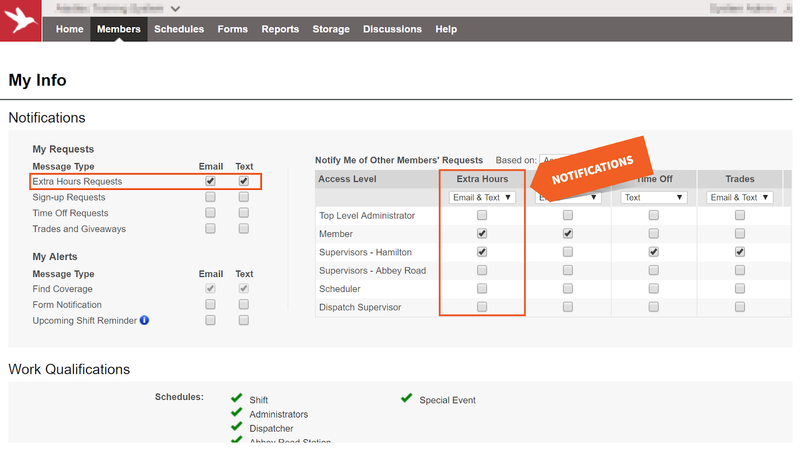 Notifications will be sent for Extra Hours requests based a member’s My Info - Notifications settings. An example of an administrator’s My Info page is shown below. Pending Extra Hours requests can be processed, depending on Access Levels, via the Dashboard, Schedule Views, My Schedule, Hourly Editor, and Change Requests. While processing an Extra Hours request, an administrator can approve or deny the request, modify the Time Type, and add notes, as shown below. 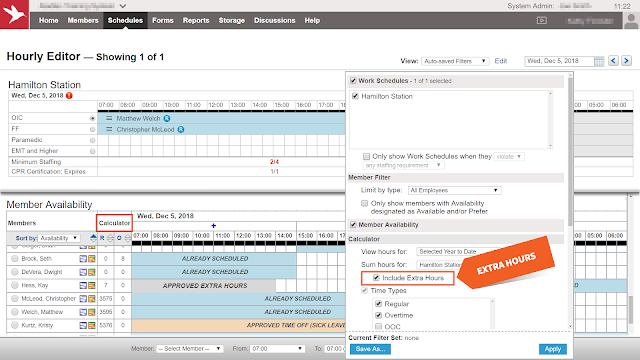 Approved Extra Hours are viewable, depending on Access Levels, in all the same places Additional Schedules (e.g. Time Off, Trades, etc.) are viewable. Below is an example of an approved Extra Hours request on the Monthly Calendar view. 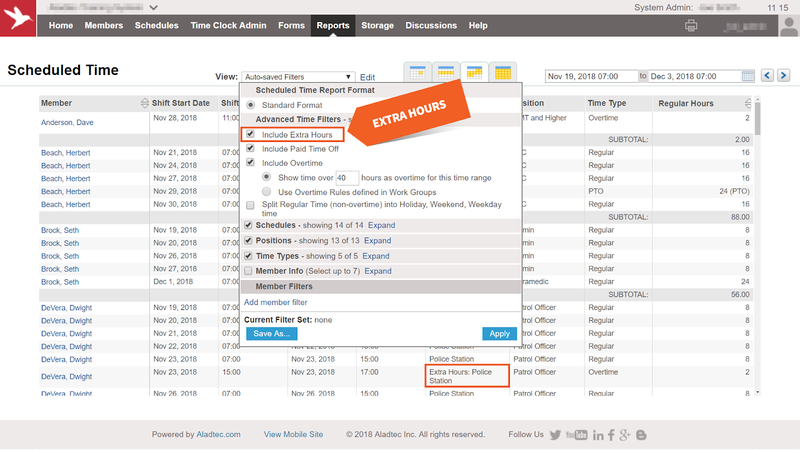 The Hourly Editor calculator can include Extra Hours when calculating total hours for members. Excluding a Time Type in the Hourly Editor calculator will exclude both Scheduled Time and Extra Hours with that Time Type. 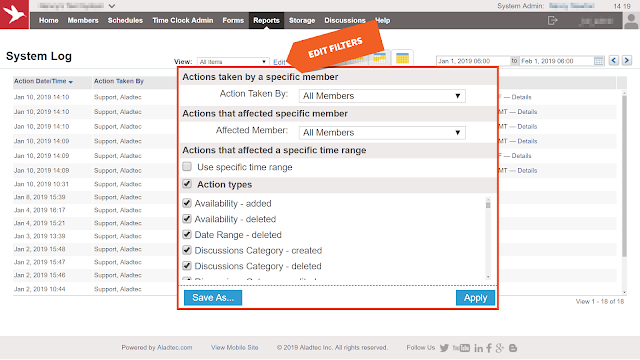 See Hourly Editor example below. 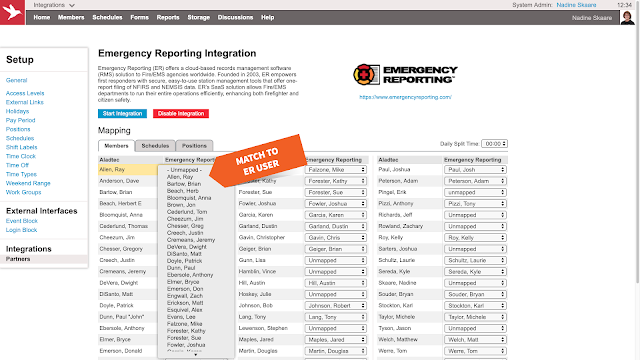 Forms used for timesheets can incorporate Extra Hours. 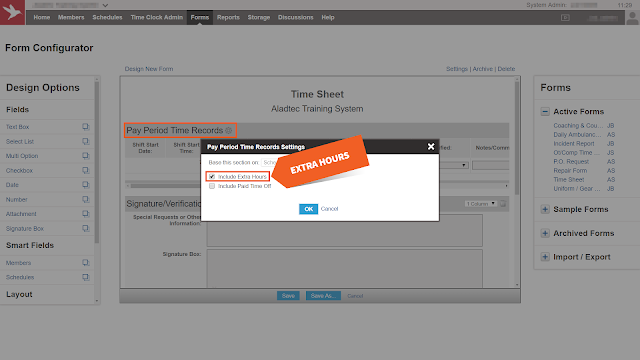 In the Form Configurator, simply update the Form’s Pay Period Time Records settings to include Extra Hours, as shown below. 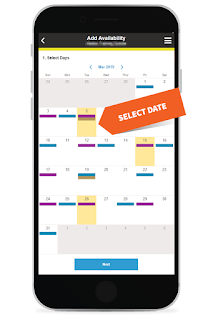 Like scheduled time changes, if Extra Hours were approved after a form was submitted, the submitted form will need to be updated to include the additional approved Extra Hours. Extra Hours can be part of Reports. 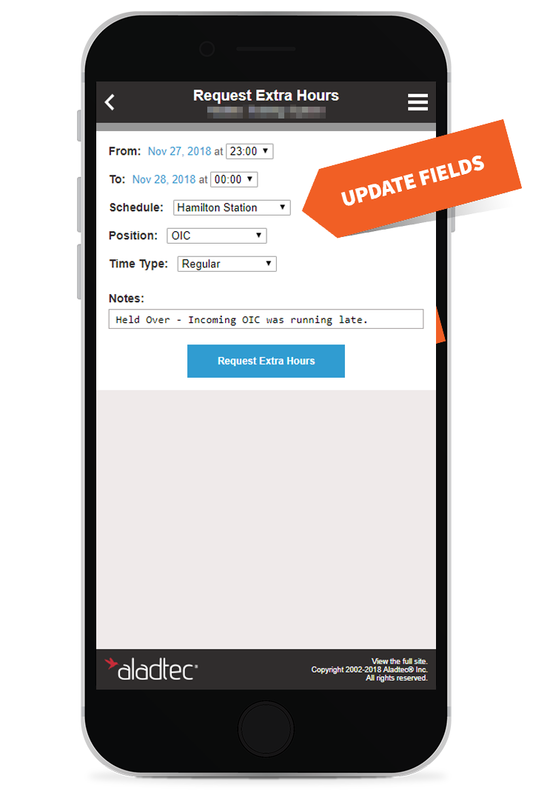 In reports, such as the Scheduled Time report, excluding a Time Type will exclude both Scheduled Time and Extra Hours with that Time Type. Once a report contains Extra Hours, if that report performs overtime calculations, the Extra Hours will be automatically included in those calculations. See Scheduled Time report example below. For additional detail on how to set up Extra Hours, watch this video. 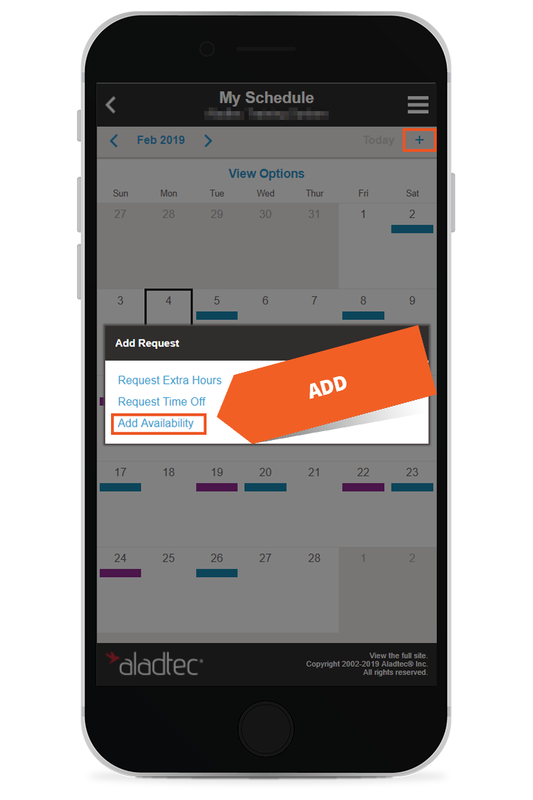 For questions or additional help with Extra Hours, please contact the Support Team at support@aladtec.com or 888.749.5550. As always, thank you for using Aladtec!